Autodesk Revit 2020 delivers several new functionalities. One that stands out from the rest was created for the structural engineer. Steel Connections for Dynamo and its sample scripts will help engineers to work more productively when modelling, placing steel connections, optimizing design and material consumption. 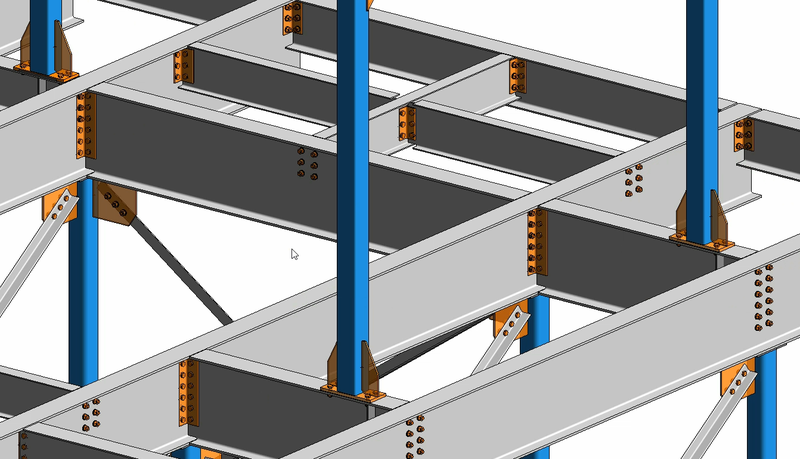 Dynamo for Revit users can create rules for adding steel connections on a structure or a selected part of it, based on new Dynamo nodes that are grouped under a new package called Autodesk Steel Connection 2020. These nodes can identify similar geometrical conditions for placing standard and custom connections and enable a simple flow of rules. Starting from previously selected model elements, these are grouped into potential connection nodes. They are filtered on certain criteria (which can be related to section, slope angle, slant angle, angle between the axes of the elements, and zone type). Finally, the connections are placed. But before all of this starts to sound too technical, it’s important to point out that the rules can be controlled from Revit by using the Dynamo player where the main parameters can be tweaked so that connections are placed as needed. The collection of out-of-the box scripts that are delivered with the Dynamo package represent both tools for immediate use of placing various connections types in steel buildings and building blocks for bespoke workflows, depending on the requirements of each project. Democratizing automated processes played a key role in defining our mission and that is why we believe rules need to be controllable by any structural engineer from within the environment that you are most familiar with. And this is what we encourage Dynamo experts to pursue when implementing customized standardization of rules for placing connections by an open rules-based system in their own companies. Imagine all the benefits of this new tool: increased productivity, greater optimization, and improved quality of modelling by reducing the number of manual operations needed for creating steel connections. In addition, you’ll benefit from improved coordination with architecture and MEP by having a detailed model available for clash checks in the early phases of the project. Before concluding, it is important to make a reference to another feature aimed at enhancing the modelling productivity for steel connections – Standard steel connections propagation. This delivers an easy and fast way to place a standard connection by propagating it automatically everywhere in the model where an identical context is found. To have more control and a wider range of applicability, the Steel Connections for Dynamo can be used to place standard and custom connections in the selected part of a model based on rules that are configurable and allow for various filtering criteria. As always, please voice your feedback as we pursue the vision of automating connections design. Let us know your ideas for making it easier, faster, and better for all users. Dan Peticila is the Product Manager for Revit, responsible for Cast in Place and Precast Concrete. Having a Structural Engineering background, he previously worked for national and international design companies, filling various coordination and engineering roles in concrete and steel projects. He holds a Master of Science degree in Structural Engineering from the Technical University of Civil Engineering Bucharest, Romania. Great tool and maybe inspiring for doing the same approach for typical reinforcement details. Great read. These features are inspiring. I am glad I stuck with Revit, even for Steel Design and Detailing.